An essay for a The Last of the Mohicans summary discuss the the story by James Fenimoore Cooper that focuses on the characters Alice and Cora Munro going to visit their father at Fort William Henry. Telling the story of a group of settlers traveling through western New York during the tumultuous times of the 1750s, The Last of the Mohicans focuses on Alice and Cora Munro going to visit their father at Fort William Henry. Along the way, they encounter a white scout named Hawkeye and two Mohican Indians, Uncas and his father, Chingachgook, the only two surviving from their tribe. They claim that the Munro sisters’ guide, Magua, has deceived them by leading them in the wrong direction and attempt to capture him, but he escapes. A back-and-forth ensues between the Hurons, the tribe of Magua, and the Mohicans; the former captures the sisters and holds them hostage unless Cora agrees to marry Magua. She refuses and the hostages are ordered to be executed, but the Mohicans rescue them before the sentence can be carried out. They eventually make it to Fort William Henry only to find it under attack from the French. Though they take refuge inside, it is only a few days later before it is realized the fort will need to be surrendered. Alice and Cora are again captured by Magua in the ensuing chaos, but are pursued by the Mohicans. Ultimately, a battle takes place and Cora is killed by a Huron, as is one of the Mohicans. Magua, responsible for the latter’s death, is also killed when he falls short when trying to leap across a chasm. The last surviving Mohican, Chingachgook, has watched his son die, and realizes that he has become the last of his race, the last of the Mohicans. Culture of Native Americans Research Papers delve into a specific aspect of storytelling among native Americans and how they pass it on. Last of the Mohicans Analysis - Last of the Mohicans Analysis term papers discuss the historical novel, by James Fenimore Cooper, that provides a glimpse into the battles fought along the American frontier during the French and Indian War. American Indian Literature - American Indian Literature research papers examine the rich culture found in Native American literature. 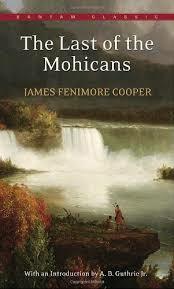 Native American Arts - The Last of the Mohicans - James Fenimore Cooper is the author of one of the most enduring tales of the American Indian in literary history. The Soft–Hearted Sioux - The Soft – Hearted Sioux presents the transformation of a boy from naivety to hard-heartedness as he confronts the traditions of his tribe against his Christian longings. Paper Masters writes custom research papers on An essay for a The Last of the Mohicans summary discuss the the story by James Fenimoore Cooper that focuses on the characters Alice and Cora Munro going to visit their father at Fort William Henry.